MISSION, KS--(Marketwired - Oct 10, 2013) - (Family Features) As the temperature begins to drop, it's the perfect opportunity to gather your circle of friends and bring the entertainment indoors. Whether it's game day or the season finale of your favorite TV show, these dishes and delectable wine pairings will make any casual get-together that much more memorable ... and delicious. From finger foods to satisfying meals, Mrs. T's Pierogies has you covered. Flavorful whipped potatoes combined with tasty additions, like cheddar cheese and onion, are gently folded into a pasta shell to create the perfect canvas for your favorite ingredients and spices. Dishes like Buffalo Pierogies and Pierogies Pad Thai are perfect for a crowd, whether you've planned ahead or are having an impromptu gathering -- just be sure to keep a few boxes of pierogies in your freezer. The Naked Grape's new high-quality 3L box wine is the perfect choice to serve alongside these dishes. As the only box wine that is fully recyclable from bag to box, you get to experience the same great tasting wine found in their bottles in an eco-friendly and attractive package that can go where glass can't. The box is perfect for large gatherings -- each box holds four bottles of wine -- and can be stored easily on the fridge shelf for up to four weeks. There's a wine for everyone with four fresh and original varietals: Pinot Noir, Cabernet Sauvignon, Pinot Grigio and Chardonnay. With pierogies and wine, no matter the occasion, you're guaranteed a relaxing and tasty time. For more recipes, visit www.Pierogies.com. And for more information on The Naked Grape, visit www.TheNakedGrapeWine.com. Preheat oven to 400°F. 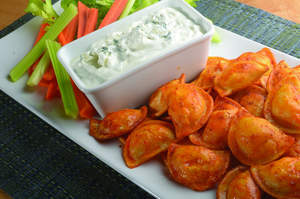 Combine oil, hot sauce and chili powder; toss with frozen pierogies. Coat baking sheet with non-stick cooking spray and spread pierogies evenly on the baking sheet. Bake at 400°F for 16 to 18 minutes, or until pierogies are puffed and browned. For best results, turn over once halfway through bake time. Serve with blue cheese dressing, carrot sticks and celery sticks. Optional: Deep fry frozen pierogies in 350°F oil for 3 minutes or until golden brown, as directed on box. Preheat broiler. Combine olive oil and chili powder in small bowl. Brush pierogies with chili mixture. Toss chicken chunks and beef chunks separately with salt and pepper to taste. Using six (6) 12-inch-long metal skewers, thread meat chunks, pierogies and bell peppers. Repeat with remaining ingredients. Broil skewers three inches from the heat source until meat, pierogies and peppers are cooked through (about 6 to 8 minutes per side). Serve with your favorite dipping sauce. Boil pierogies according to package directions. Drain. Meanwhile, in 12-inch skillet over medium-high heat, melt butter; cook eggs until just scrambled, stirring constantly. Remove to bowl. In same skillet, heat peanut oil; over medium heat, cook garlic until lightly browned. With slotted spoon, remove garlic to bowl with eggs. In drippings remaining in skillet over medium-high heat, cook chicken until well browned and cooked through, stirring constantly. Add salt and crushed red pepper. Stir in egg mixture, peanut sauce, bean sprouts and cooked pierogies. Toss to mix well. Garnish with chopped peanuts and scallions. In medium bowl, stir softened cream cheese, pesto and salt until well blended and smooth. Sauté pierogies as package directs. Arrange pierogies on large serving platter; top each pierogy with small dollop of pesto mixture. Top each with some roasted red pepper strips; sprinkle with pine nuts. Place pierogies in boiling water; cook about 5 to 7 minutes. Meanwhile, sauté onions and butter in medium saucepan over medium heat. Place sautéed onions into large bowl. Add cooked pierogies and mix gently. Serve and top with sour cream, if desired. This and other food and lifestyle content can be found at www.editors.familyfeatures.com. Family Features is a leading provider of free food and lifestyle content for use in print and online publications. Register with no obligation to access a variety of formatted and unformatted features, accompanying photos, and automatically updating Web content solutions.